I am not a professional photographer, but I have recently discovered a passion for photography. It all started when I adopted my lovely cat Arthur in 2012, and I wanted to share and show his beauty. So what better way? Taking pictures obviously! Arthur still remains my favorite model. But I also like to photograph stray cats or shelter cats. I think they are so proud, elegant, wild, and beautiful of course. I am always looking at them with such admiration. “I gatti di Vicenza” is my Facebook page that I started in January 2013 with the purpose to help rescued cats find forever homes. Furthermore, I organize events to collect food for stray cats. Here are some pictures of the event where I sold some of my photos of stray cats. 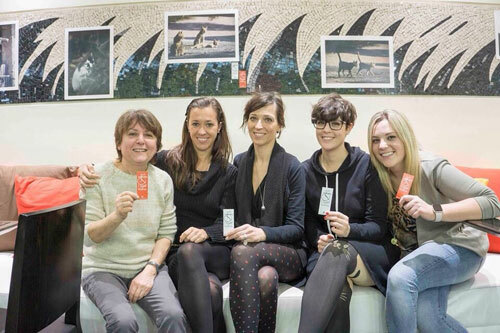 Marianna (center) with friends who helped at the latest event. 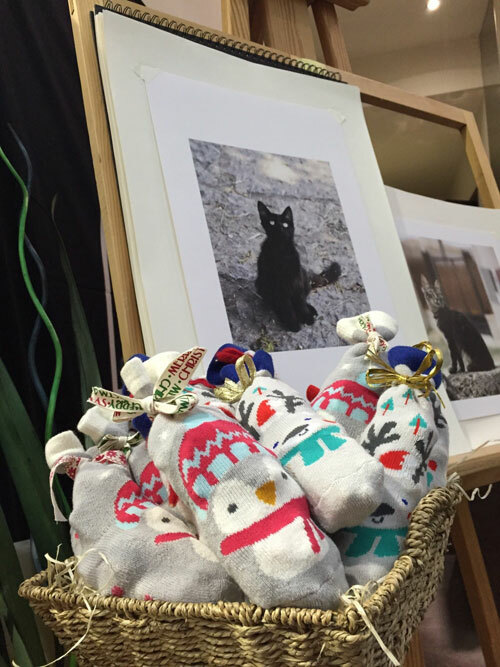 During the last event we held on 3rd January 2016, we also collected money to buy a little wood home for some cats that live in the countryside near Vicenza. 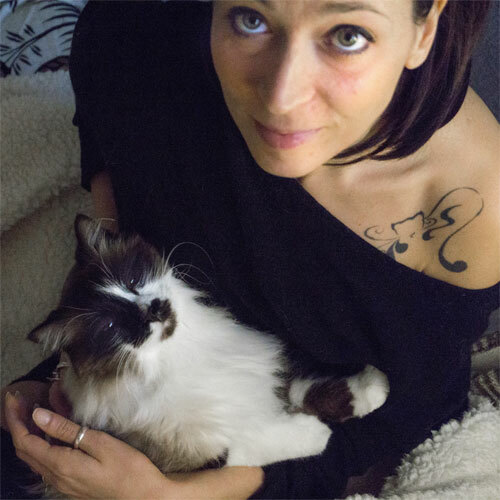 Next month, Three Chatty Cats will be featuring Marianna’s project called Passions. Here’s a sneak peek! 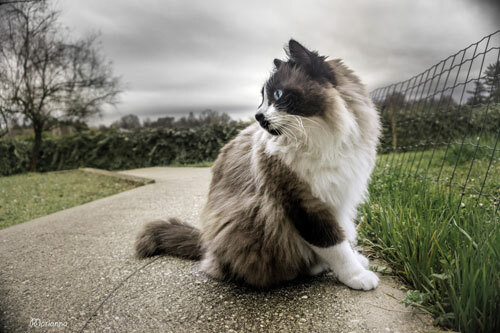 Thank you to “catographer” Marianna for sharing her beautiful pictures with us and for helping stray kitties in Italy. You can follow Marianna on Instagram (@marianna_catographer) and Flickr and also connect with her I gatti di Vicenza Facebook page. Thank You so much!! You are all very kind :) thanks a lot!! Amazing photos! It makes me want to visit and help with their wonderful projects :) Good luck to Marianna and her team! Beautiful person and beautiful photos. Thank you Mariannna. Stunning photos! I adore that last shot! amazing photography! Italy and cats, a winning combination! Thank you Marianna! 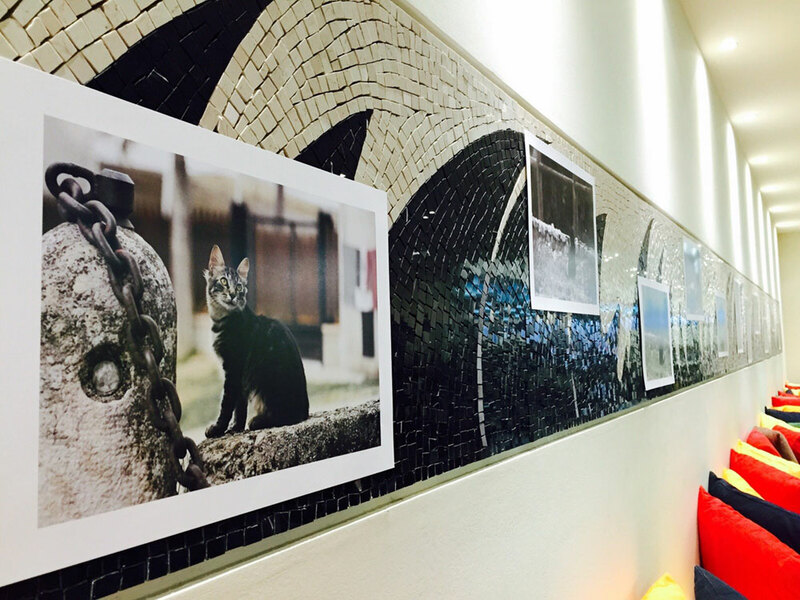 Good photos help shelter cats get adopted. It worked with me. Has she thought about putting her photos in a book and selling it for charity? CK, that is an awesome idea! I will have to ask her! Oh wow! Those photos are so gorgeous! I love kitties, too! Those are lovely photos! I especially like the B & W ones. Oh MeOW What bootyful fotos and kitties of course. She sounds pawsum. Fanks fur helpin’ da kitties. I will definitely pass that along to her, thank you! Marianna’s work is just gorgeous…I’m particularly fond of the B&W’s!!! Lovely photographs both color and black & white. Her photos are beautiful! We love the one of the black cat looking through the bike spokes. Wow. These photos are stunning. My brother is currently stationed in Vincenza with the US Army and he LOVES cats, so this hits close to home. Thanks so much for sharing. I’m going to share with my sister and my mom also. They will love this! The black and white photos are so visually stunning. Marianna is an amazing photographer, thanks for introducing her to us. Such wonderful photos – thanks for sharing this talented photographer with us. I think I like the cat in the bag best! OMG, I think her photos are incredible! They have such an etherial or spiritual feeling to them. I love them and have just signed up to follow her. Thanks for another wonderful post. I have a question for you so email me when you have a chance thedailypip(at)gmail(dot)com. Thanks! These are some really fantastic photos. That last photo of the cat with the ballerina is fabulous and her pics are beautiful! I’m so glad you shared this story! Beautiful story AND photos. Thank you for sharing. These are gorgeous photos. I always love reading about people who use their talents to help homeless pets. Such spectacular photos! So glad you shared Marianna’s work with us. Looking forward to seeing and learning more about her project, Passions. Great photos! I want to take some photography classes. I agree, this inspires me to want to take some classes too! Love these! They are so amazingly beautiful!!! Such beautiful photos- great talent- and a great project. Thanks for sharing. These photos are so gorgeous! I will definitely be sharing this soon. :) Photography is an art that requires the artist to express their view on a subject without any words. I think that Marianna has done an incredible job with it. Marianna is really talented, these photos are gorgeous! It’s so nice that she uses her talents to help kitties of Italia! So many beautiful photographs! I think taking photos of cats is much harder than dogs. Perhaps that’s part of why I blog about dogs but i have more cats than dogs? Thank you for spotlighting Marianna. She deserves some kudos for her work! Wow! That is quite the talent she has there! :) Thank you for letting us know about her. I just wish she had a WP blog as I don’t go on Instagram as much! Hahaha! Marvelous photos, I like how “soft” and dreamy they are! What wonderful photos! She’s really great at capturing cats on camera. Thank You all! I’ve just red your beautiful comments and they Made me so proud!! How did you discover Marianna and her work? It’s wonderful that she agreed to an interview and a display of some of her photos. Cats are an inspiration, aren’t they? My first inspired my life in animal welfare. Arthur is definitely elegant! 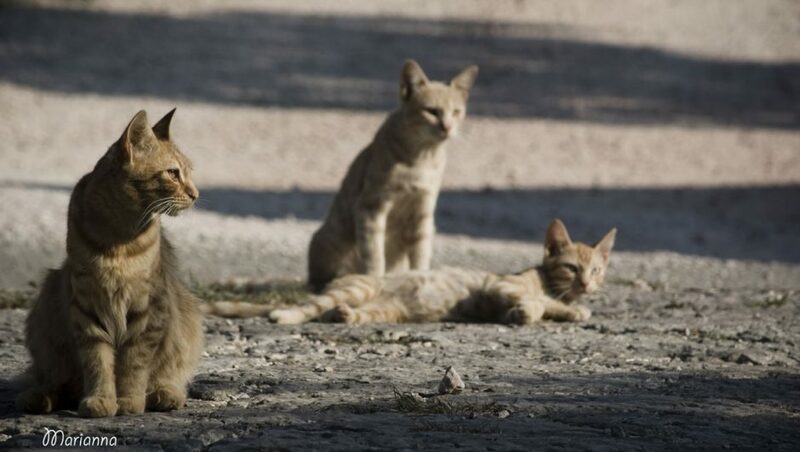 I’d love to know more about how Marianna manages to photograph strays. I actually found Marianna through Instagram. I was just browsing cat pictures and saw the one of the cat with the ballerina – and I fell in love! I contacted her and then found out about her rescue work as well! I’ve found other cat photographers through Instagram as well.